We report on a community effort between industry and academia to shape the future of graph query languages. We argue that existing graph database management systems should consider supporting a query language with two key characteristics. First, it should be composable, meaning, that graphs are the input and the output of queries. Second, the graph query language should treat paths as first-class citizens. Our result is G-CORE, a powerful graph query language design that fulfills these goals, and strikes a careful balance between path query expressivity and evaluation complexity. Angles Rojas, R, Arenas, M, Barceló, P, Boncz, P.A, Fletcher, G, Gutierrez, C, … Voigt, H. (2017). 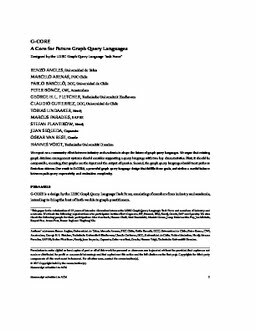 G-CORE a core for future graph query languages.